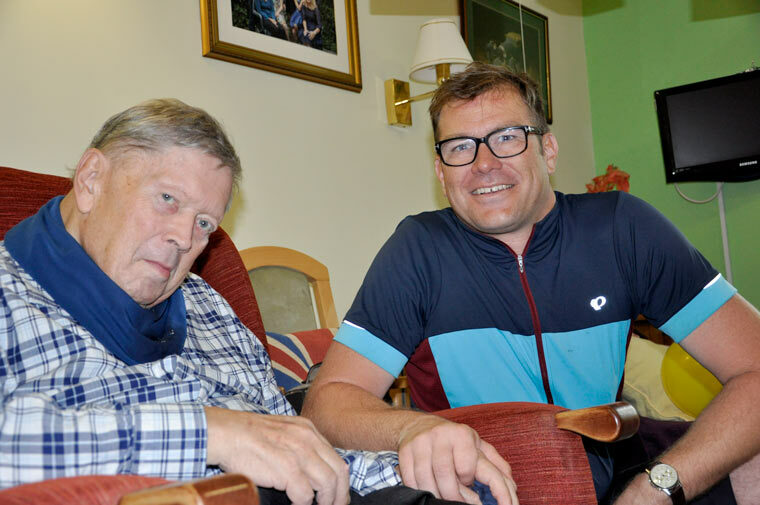 A big-hearted German businessman cycled 1,400km in a week to arrive at a Dorset dementia care home and thank the mentor who inspired him as a young student as well as raise more than £2,000 for Parkinson's UK. Nicolas Guenther, who was 19 when he first met Peter Matchan, has raised more than £2,000 for Parkinson’s UK by completing the journey to Dorset all the way from Munich. He decided to try the gruelling personal challenge after hearing that Peter, now 79 and a resident at Colten Care’s Fernhill home at Longham near Bournemouth, is living with Parkinson’s. Business consultant Nicolas, 41, spent time with Peter and his family while he was staying in Havant and attending a course at Chichester College. The pair shared a keen sense of humour and struck up a lasting friendship. Nicolas averaged 160km a day on the trip and had to deal with emergency puncture repairs, broken spokes and navigating cycling trails through Germany, France, Belgium and across the south of England from Dover. There was eager anticipation at Fernhill as Peter’s daughter Lyn Place, granddaughter Anna and staff members tracked Nicolas’s progress online ahead of his arrival at the home. Fernhill Activities Organisers Karen Grant-A’Court and Ann-Marie Knight helped Lyn organise the reception for Nicolas complete with German flags, bunting, champagne, a guest room for him to unwind in, and a ‘finish line’ at the door of Peter’s room.